Also referred to as "Spiralacing", this patented method has the laces angled one way on the outside and the other way on the inside. The resulting double helix reduces friction and allows faster, easier lacing. • Begin straight across the bottom (grey section). 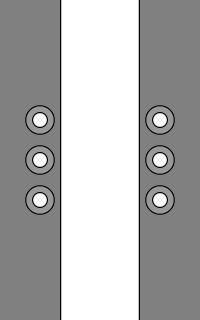 Note the unusual path: Feed the left end OUT through the bottom-left eyelet. 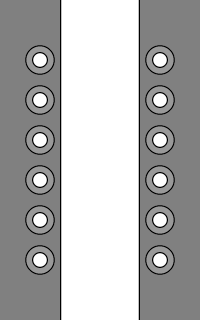 Feed the right end IN through the bottom-right eyelet. • At each eyelet pair, the right end runs diagonally up on the inside and out the next higher eyelet on the left, while the left end runs diagonally up on the outside and in through the next higher eyelet on the right. Repeat until lacing is completed. The left and right shoes can be laced in reverse (mirror image) so as to end up with a symmetrical look. This method was invented and patented by Monte Fisher for faster and easier lacing of shoes and boots. 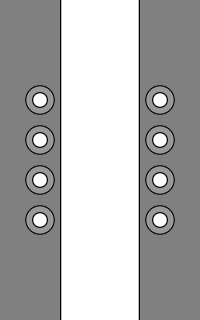 The idea is that there is less friction between the laces and the edges of the shoe flaps, plus negligible contact between overlapping laces, reducing friction even further. 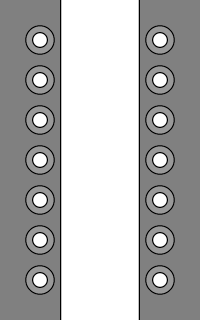 In addition, as illustrated in Monte's patent, groups of two adjacent laces can be pulled simultaneously (see animation at right). All these factors combine to make tightening and loosening easier, especially on tall boots with many eyelets. 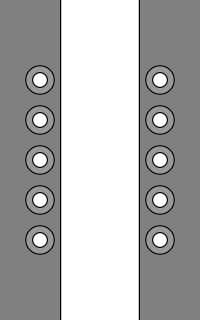 Like various straight lacing methods, Double Helix Lacing has an additional benefit for sporting or military use: The upper horizontal sections of shoelace can be quickly cut through with a knife or scissors in order to more easily remove a boot from a broken, sprained or otherwise injured ankle or foot. Note that most military forces have regulations for just about everything, so I'd recommend that military personnel check before they adopt this – or any other – possible non-regulation lacing method! Nike Blazer Highs with Double Helix Lacing. Lengths available: 27" 27" | 36" 36" 40" 45" 45" 54"
"I also particularly like the double-helix lacing method. I'll use left and right helixes on my left and right feet. A purist would also use different-handed knots on the two shoes, but I'm not sure my motor memory would be able to handle that in the early morning." "I've switched to double helix lacing, which lets me have a nice symmetry and I don't have to worry about criss-crossing, and using your 'Ian's knot.' It's great not only because of how fast it is, but it lets me not worry about checking to ensure that the loops are equal." "If you'd like more info on how I came up with spiralacing, I'd of course be happy to provide (it involves caving...). I'm curious if there are other methods that focus on utility, overcoming problems with the usual methods -- I figured out my method because I was annoyed with the difficulty of tightening and loosening laces on army boots that were wet and muddy (from ... caving)." "I chose the Double Helix Lacing method for lacing all my shoes (I used to use the "Shoe Shop" method because it was easy and looked good, I find Double Helix more stylish, easier to tighten & loosen and far more comfortable on the foot)." "In my lifetime, I've laced my shoes several different ways, but I'd always assumed one's preference was based on aesthetics and shoelace length. Now I know that the lacing method also affects the life span of my shoes, my laces, and probably my feet! From now on, I'm only going with Over Under and Double Helix." "I've been using double helix lacing on a pair of 8-eyelet-pair boots daily for a year or so now, and one thing I've noticed is that the laces keep getting twisted, to the point where they even get stuck tightening them. About once a week I find I have to untwist the laces by rotating them to keep them tightening smoothly. I've tried to pay attention, but there doesn't seem to be anything I'm doing to cause this. Have you heard of this problem before? It perhaps seems worth mentioning as a con for this lacing method." "One tip/observation that may be of interest: I tried the double helix method yesterday and found that it created more room over the instep. I was wearing a pair of balmorals the felt tight around the tongue and, bingo, must looser. You may want to add that as a benefit of the method for those with a high instep." 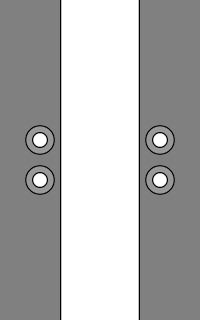 Modified high-friction variation that instead 'locks' rows. Similar friction-reducing concept that uses alternating over and under crossovers. Different lacing method that is also for quick tightening of boots. View and customize Double Helix Lacing using Create-a-Lace. 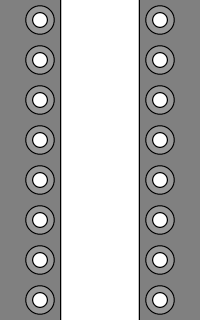 Monte invented and patented the Double Helix Lacing method.